Offshore, there's no telling what you might find. Sit back in your lounge chair, make sure your drink is cold and listen to the afternoon fishing report. On any given day it might list just about everything you see in these designs. The Red Grouper in the "Chocowhatchee Bay Four" may be found closer to home but this Florida Panhandle group are Gulf Favorites! Key West Offshore, "It's always Jumpin'!" They all come "Out of the Blue," -- the deep deep Blue. 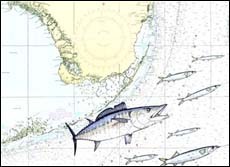 The Florida Keys--a tiny chain of Islands--but "Wahoo!!" is Big, BIG Offshore fun! 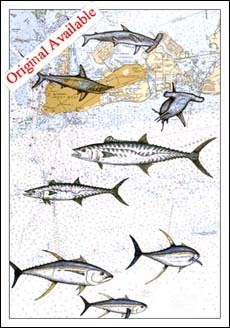 You'll need a copy of this one to find your way to the best Offshore fishing around. 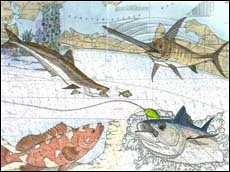 "Offshore Seven" surrounds the Florida Keys with a fine circle of Friends.